Small volumes of PRG2 recombinant protein vial(s) may occasionally become entrapped in the seal of the product vial during shipment and storage. If necessary, briefly centrifuge the vial on a tabletop centrifuge to dislodge any liquid in the container`s cap. Certain products may require to ship with dry ice and additional dry ice fee may apply. A major human basic functional protein of eosinophil granule (s), human bone marrow proteoglycan PRG2, increases expression during pregnancy and experimental evidence demonstrates active enzymatic activity against parasitic infections caused by cell entry. However, mechanisms and potential target proteins is an open field.judging by cited Pubmed and PMC abstract database searches. MyBiosource is offering a gene and Uniprotkb protein sequence verified recombinant PRG basic protein for your research problems. Expressed in multiple system, HIS tagged and SDS-Page purified, we supply economical size ranges to meet any lab budget and needs from 0.1 mg for baculovirus or yeast system to 1 mg quantities for E coli or mammalian systems. All eosinophil major basic protein PRG2 is shipped with extensive href manual and all technical information you will need to extend your experiments. This product is available in US, Europe and worldwide. This protein is the predominant constituent of the crystalline core of the eosinophil granule. High levels of the proform of this protein are also present in placenta and pregnancy serum, where it exists as a complex with several other proteins including pregnancy-associated plasma protein A (PAPPA), angiotensinogen (AGT), and C3dg. This protein may be involved in antiparasitic defense mechanisms as a cytotoxin and helminthotoxin, and in immune hypersensitivity reactions. It is directly implicated in epithelial cell damage, exfoliation, and bronchospasm in allergic diseases. NCBI/Uniprot data below describe general gene information for PRG2. It may not necessarily be applicable to this product. Cytotoxin and helminthotoxin. Also induces non-cytolytic histamine release from human basophils. Involved in antiparasitic defense mechanisms and immune hypersensitivity reactions. 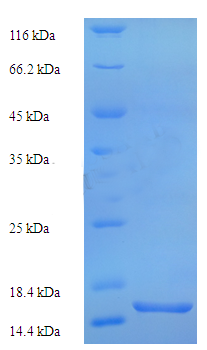 The proform acts as a proteinase inhibitor, reducing the activity of PAPPA.